The history and the discovery of the Great Sphinx in Egypt. The figure of Sphinx was buried for most of its life in the sand. It was King Thutmose IV (1425 - 1417 BC) who placed a stela between the front paws of the figure. On it, Thutmose describes an event, while he was still a prince, when he had gone hunting and fell asleep in the shade of the sphinx. During a dream, the sphinx spoke to Thutmose and told him to clear away the sand. The sphinx told him that if he did this, he would be rewarded with the kingship of Egypt. Thutmose carried out this request and the sphinx held up his end of the bargain. Of course, over time, the great statue, the only single instance of a colossal sculpture carved in the round directly out of the natural rock, once again found itself buried beneath the sand. In the more modern era, when Napoleon arrived in Egypt in 1798, the Sphinx was buried once more with sand up to its neck, at by this point, we believe the nose had been missing for at least 400 years. Between 1816 and 1817, the Genoese merchant, Caviglia tried to clear away the sand, but he only managed to dig a trench down the chest of the statue and along the length of the forepaws. Auguste Mariette, the founder of the Egyptian Antiquities Service,also attempted to excavate the Sphinx, but gave up in frustration over the enormous amount of sand. 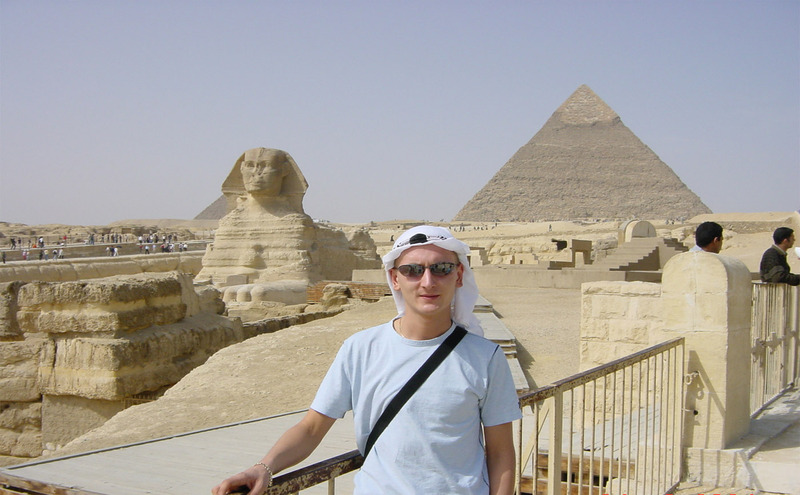 He went on to explore the Khafre Valley Temple, but returned to the Great Sphinx to excavate in 1858. This time, he managed to clear the sand down to the rock floor of the ditch around the Sphinx, discovering in the process several sections of the protective walls around the ditch, as well as odd masonry boxes along the body of the monument which might have served as small shrines. However, he apparently still did not clear all the sand. Between 1925 and 1936, French engineer Emile Baraize excavated the Sphinx on behalf of the Antiquities Service, and apparently for the first time since antiquity, the great beast once again became exposed to the elements. In fact, the sand has been its savior, since, being built of soft sandstone, it would have disappeared long ago had it not been buried for much of its existence. It is the largest monolith statue in the world, standing 73.5 metres (241 ft) long, 19.3 metres (63 ft) wide, and 20.22 m (66.34 ft) high. It is the oldest known monumental sculpture, and is commonly believed to have been built by ancient Egyptians of the Old Kingdom during the reign of the Pharaoh Khafra.